NEW YORK—Rep. 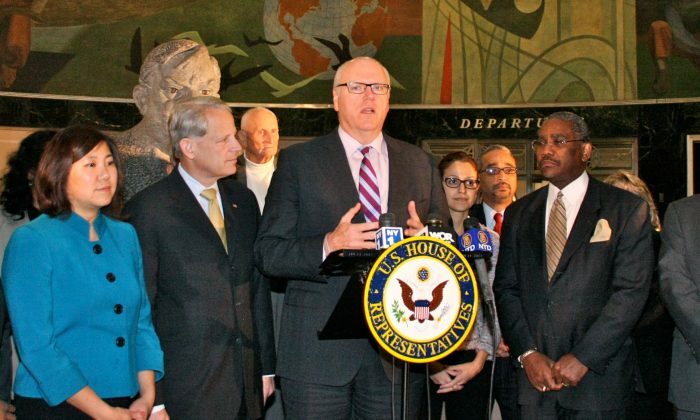 Joe Crowley, elected officials, and local advocates introduced the Silent Skies Act Friday morning at LaGuardia airport’s Marine Air Terminal. The bill aims to alleviate noise pollution in Queens borough neighborhoods, where residents claim that aircraft noise has ruined their quality of life by disrupting sleep, impeding student learning, and reducing the time they spend outdoors. The act will require the Federal Aviation Administration (FAA) to issue a regulation by the end of 2015 that requires all commercial airplanes to meet Stage 4 noise standards, which have a much lower decibel level than those of aircrafts used today. “Our airports are only getting busier,” Crowley (D-N.Y.) said, which he noted is a good thing overall. “But that doesn’t mean our communities need to suffer in their quality of life,” he added. In 2005, the FAA recommended all aircraft be retrofitted with new engines or upgraded to meet Stage 4 noise levels. Although the new aircrafts introduced by the airlines met FAA noise standards, the older planes have not been modified. “This problem, in the 11 months that I have been in Congress, has probably been one of the top concerns of the constituents who we’ve had contact with in our office,” said Rep. Grace Meng (D-Queens). The new act will require the FAA to enforce a regulation to phase in the quieter engines at a rate of 25 percent of a fleet every five years—meaning all commercial planes would meet the standard by 2035. The bill will also create a fund to encourage research and development of new, quieter engine technologies. The partnership is a $10 million grant program requiring a portion of revenue from the sales of successful engines to be paid back into the program.